Liga.Tennis Center & Academy. A tennis paradise in Bali for all levels, all ages, all year-round. Liga.Tennis Center & Academy together with Dharma Residence is a 6-hectares high-end tennis, sport and lifestyle complex, located in the heart of Bali’s prime area. With more than 330 sunny days a year, the LTCA provides the best possible weather conditions for enjoying tennis for families, groups, amateur, and professional players. 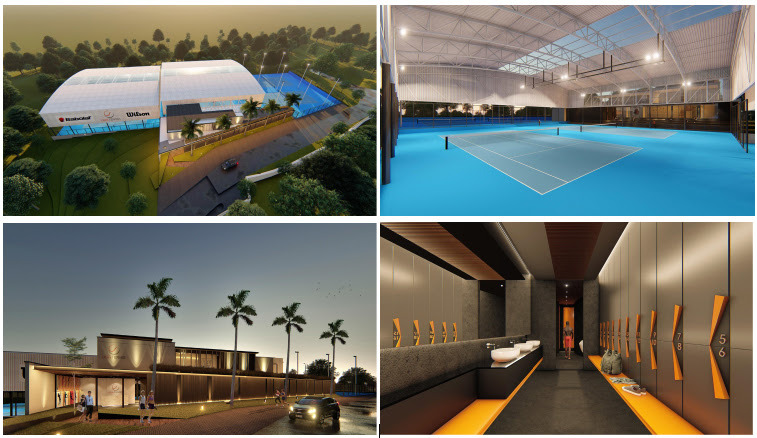 Liga.Tennis Center & Academy (LTCA) will be equipped with: 4 indoor and 2 outdoor ITF standard hard tennis courts, club area, restaurant, 2 classrooms, tennis store, lockers, and a massage room. Here are some visualizations of the new center. can apply for membership (we will be offering a very limited number of memberships). can sign up at early bird price for our future tournaments, including our inaugural championships. receive updates about our upcoming events, products and news. In other words, LTCA club on Liga.Tennis platform is our official communication channel. No Facebook. No Twitter. No emails. It's free of charge and there are no obligations for you. It is highly recommended you to download our Liga.Tennis app from Apple Store or Google Play Market and allow notifications. Thank you for being on our team. There are exciting times ahead and tennis in Bali will never be the same! Address: Jl. Bumbak Dauh, Umalas, Bali 80361, Indonesia. Only 1 week left for the limited early-bird discount for our yearly memberships! We only provided 50 of them for the opening and we only have 17 left. Don't wait, get active and become part of the biggest tennis community of Bali. Go to https://liga.tennis/ltca/membership and get your hands on our last available memberships. Who will stop Putu Agassi? Tim Baker or Prima? Proudly we present The Yak Magazine as our official media sponsor. With more than one million engagements per year across print, online and social media, The Yak Magazine is so much more than just a luxury lifestyle magazine. Did you see us in the latest edition?